“New realities” covers a whole gamut of application areas including film, games, music, communications, medicine, forensics, simulations, education, and virtual tourism. The technical requirements for new realities cover obvious areas such as spatial audio and synthesis but extend beyond into audio networking, semantic audio, perception, broadcast, and online delivery. There will therefore be a need for good cooperation with existing AESTC Technical Committees providing leadership in related disciplines. 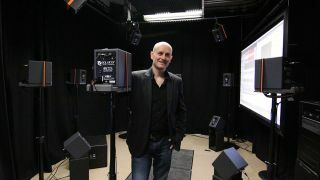 Dr. Gavin Kearney, researcher and lecturer at the University of York, has been appointed as the group leader. “We’ve asked Gavin to lead this group, as it is an area close to his heart, and also as he is well connected with key industry members while retaining a degree of objectivity in his academic position,” Kelly said. “The AES has a legacy of embracing emerging audio applications and markets,” said AES president, Alex U. Case. “That includes audio for virtual, augmented, and mixed reality, where there’s so much excitement and progress. Beginning with the landmark AES AVAR Conference, AES has focused the expertise, knowledge, and skill of its membership on the vast range of creative possibilities to be explored and the breadth of technical challenges to solve in this fledgling market sector.